Blackheads, we have all gotten them, and all hate them. Blackheads are one of the most annoying skin concerns that bothering the beauties, and it’s difficult to get rid of. However, there still ways to nix them. Before that, it’s important to understand why they are in your skin first. “We regenerate a new skin layer on the top every three months,” expert says, “That cycling process doesn’t correctly happen in some people, thus a buildup of oil clogs pores.” There are various factors for people to get blackheads: your age, sun damage, Hormones can all harm the natural cycling of skin. Luckily, there are dozens of blackheads treatment products such as peel off masks, pore strips, manual tools, and the newly rise of electric blackhead removers on the market to help with. All of these products claiming themselves to be most effective and the least painful. It can be a difficulty to sort out an item that’s suitable to you. If you have a plan to purchase a blackhead remover, take a look at our latest new arrival. 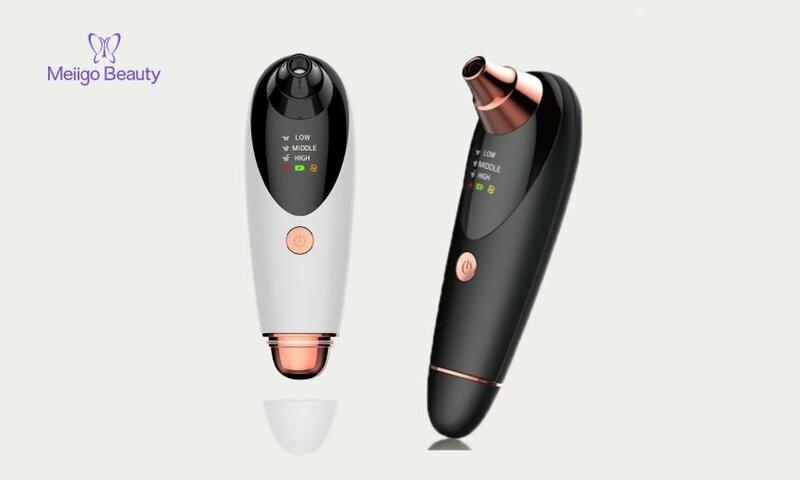 Besides the 3 replaceable heads and 3 vacuum suction levels, this new blackhead remover also functions with hot compress vibration, which can help open pores. Blackhead removers work better when your pores are open. Heat opens pores. Usually we need to apply hot compress with a towel to open pores before extracting blackheads. With our blackhead remover, you can directly use the hot compress function to move around the nose to open pores, and then choose the suitable suction level to remove blackheads effectively. It’s much convenient and time-saving. * Daily deep cleansing is of great importance. Wash your face twice a day to prevent new blackheads. Remember, don’t go to sleep with makeup. * Don’t pick at your blackheads. Sometimes it gets worse. * Don’t use a blackhead remover frequently to avoid irritation. Once or twice a week is enough. * Don’t use a lot of force when using the blackhead remover. The skin on your face is delicate, putting too much force on it can damage your skin. Using the tools with gently force is enough.